Perhaps the most famous Lithuanian-American in Springfield in the 1940s was in show business: Joey Yanaitis (Janaitis or Jonaitis) Mack. Famous in Boston, Rockford, Cleveland, Augusta, Ga., and dozens of places in between from the late 1930s through the 1940s, Joey was the male half of the traveling married vaudeville dance team of Betty Jo (Yanda Connors) and Joey Mack (billed as Jo and Joey Mack). Joey and Betty Jo made a significant contribution to entertainment in Springfield back when civic groups routinely put on amateur dance programs with sketches and costumes based on vaudeville and the silver screen. In 1945, as their USO and vaudeville careers were winding down, Betty Jo gave birth to the couple’s son, Jerry. The family settled in Betty Jo’s hometown, Springfield, and Jo and Joey opened the Mack Professional School of Dance, first in the old Kerasotes Building downtown – where the school of Betty Jo’s instructor, Mildred Caskey, was located — and then at Spring Street and South Grand Avenue. Many later Springfield-area dance teachers first studied or taught at the Mack school before it closed in 1968. Joey’s obituary from 1995 reports that he was born in 1909 in Amsterdam, N.Y., the son of Lithuanian immigrant Anthony Yanaitis and Sally (Snow) Yanaitis. His early days are shrouded in mystery, though Joey told a newspaper reporter in 1981 that he was 13 in upstate New York when Bobby Mack and his son Harold “took him in and gave him their name.” It’s unclear exactly when, but Joey joined a comedy and acrobatic vaudeville act called The Mack Brothers and proceeded to perform not just at New York City’s biggest live-entertainment theatres, the Paramount, Palace, Hippodrome and Capitol, but also in London, France, Italy and Germany. 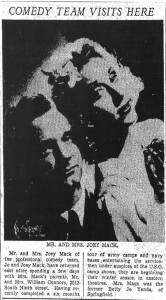 Other clippings hint at a gig with Alvin Feig as part of a Cleveland, Ohio “song and dance team” that included a jazz band and before that, a stint with silent film star Wesley Barry’s stage act. The fact that Joey played the violin, sometimes on the floor of the Illinois Senate in his last stint as the Senate’s sergeant-at-arms, and that his obit states he was a long-time member of the American Federation of Musicians, seems to support the Cleveland connection. Joey met Betty Jo Yanda Connors, a professional dancer (“chorus girl”) when they were both traveling separately on the vaudeville circuit in 1939. Betty Jo was the step-granddaughter of famous Springfield featherweight fighter, sports promoter and hotel owner Johnny Connors. Betty Jo came from a line of dancers. Her maternal grandfather, Aidan Moses McCann, won several prizes in local dance contests. Betty Jo’s mother Jerry McCann (Yanda) Connors, born in 1899, was a bathing beauty who appeared in “Yankee Doodle in Berlin,” a 1919 comedy/World War I propaganda silent film produced by Mack Sennett. Jerry toured for three years promoting that film and others, one starring Gloria Swanson. So it’s no surprise daughter Betty Jo had the stage bug. Billed as “novelty entertainers,” a “madcap dance team,” “comedy knockabout dancers,” and “knockabout funsters,” Jo and Joey combined Betty Jo’s refined dance skills – some of them acquired at the famous Martha Graham school in New York – with Joey’s vaudevillian comedy acrobatics and pantomime. In typical live-theater vaudeville style, their touring act often followed a “warm-up” burlesque show – exotic ladies of all descriptions. After the burlesque was over, band and singing acts and other comedy and dance routines like Jo and Joey Mack’s closed out the evening. 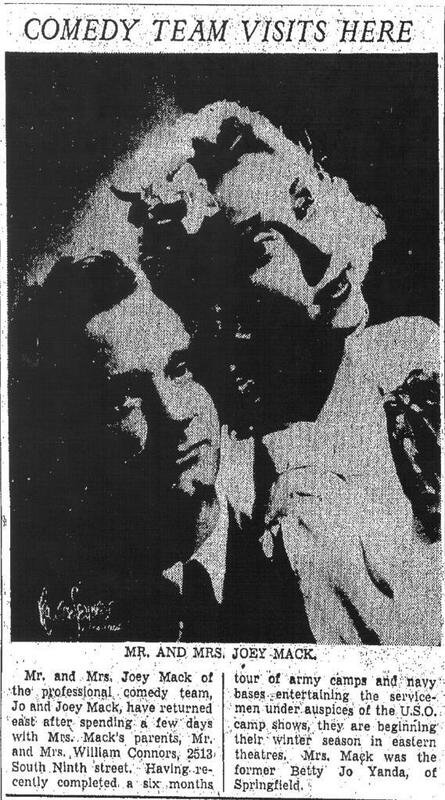 One description of their act is that Betty Jo would dance and Joey would “fall down a lot.” Another clipping refers to Joey’s hilarious pantomime of a woman getting dressed in the morning. Joey considered his comic impressions and mannerisms a core component of his tradecraft. Unfortunately, not a single glossy publicity photo of Joey or his wife survive in the Sangamon Valley Collection at Lincoln Library. At the peak of their Springfield careers in 1956, “Mack Enterprises” included dance studios in Springfield, Taylorville, and Southern View, a dance accessory store and a costume manufacturing business, as well as a professional troupe of actors and dancers. Betty Jo also worked as a women’s physical education instructor at the former Springfield Junior College, Joey made and repaired violins and wrote comedy scripts for old show business friends, and the couple occasionally performed a traveling act that included their young son, Jerry. The Macks divorced in the 1960s, and Betty Jo moved to Carbondale to head Southern Illinois University’s civic center theater. She later remarried. Joey stayed in Springfield, where, for a time, he continued to teach dance. In 1963, however, he also became a doorman for the Illinois Senate, where he finished his working life as Senate sergeant-at-arms. Thanks to Chuck Tisckos of St. Charles, Mo., for inspiring and helping with this post. Copyright Lithuanians in Springfield, Illinois, by Sandy Baksys. Excerpted by permission. This entry was posted in Amusements, Arts and letters, Ethnic groups, Lithuanians, Social life. Bookmark the permalink.